Given the significance of the details in these coincidences, there seems to be something more than Synchronicity at work here. It almost seems as if Grissom is a kind of idol to Obama, whose symbolic footprints the new President seems to be walking in. 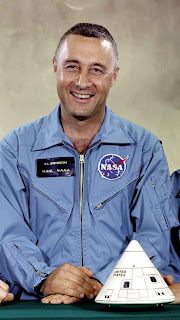 Indeed, Grissom's first flight into space took place two weeks before Obama was born. And one of the ways Obama seems to be paying tribute to Grissom in his antagonism towards the NASA heirarchy, which the new President believes has failed in its mission. Although he identifies himself very clearly with space exploration (and sci-fi), Obama's relationship with NASA has been tense. As with so many aspects of government that I predict we will see under his administration, it appears the military will assume much greater control over the space program. According to Newsday and other sources, Retired Maj. Gen. Jonathan Scott Gration will be appointed as director of NASA, even though partisans of present honcho Michael Griffin have lobbied heavily for Obama to keep him on. There are plans for the Army to take over the rocket program for future launches. And Obama has reportedly tapped Dave Noble, director of voter mobilization in the gay community, to be White House liaison to NASA, which makes for an interesting symbolic conjunction. The fact that the ISiS crew watched the Inauguration from space seemed to be particularly noteworthy to the media. Were Michael Fincke and Sandra Magnus playing the role of Obama's heavenly parents, the Osiris and Isis to his Horus? It would certainly make sense in the overall narrative that we've seen constructed around NASA for the past 50 years. And all of this must be put in context with the mad dash the entire world is making for the heavens, regardless of what's going on in the global economy. 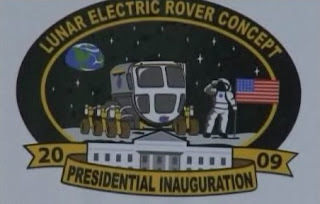 But it almost seems, given the avalanche of stories about his wranglings with NASA, that Obama has a very powerful personal connection to the space program. And indeed he does. 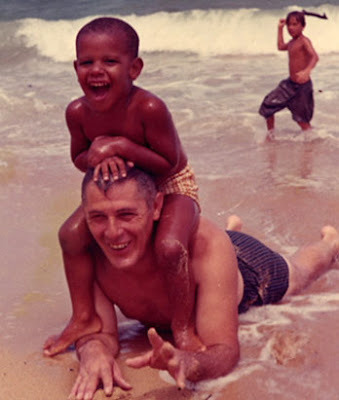 "GRAMPS HAD ENTERED THE SPACE AGE"
"One of my earliest memories is of sitting on my grandfather's shoulders as the astronauts from one of the Apollo missions arrived at Hickam Air Force Base after a successful splashdown," Obama wrote in Dreams From My Father. Powerful stuff. The space program had an incredible mystique in the 60s, and for a young child to be recognized by an astronaut was tantamount to being blessed by the Pope in Medieval Italy. For a biracial boy in majority-Asian Hawaii, this kind of acknowledgment could be a tremendous validation. 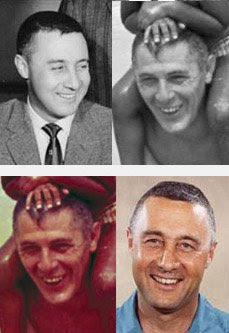 ...in that photo, Obama's grandfather Stanley Dunham looks remarkably like Gus Grissom. The nose and the chin are particularly striking, as are the squinty, smiling eyes. What must have a young Barry thought when seeing pictures of Grissom, particularly after his death? This is especially significant given that his grandfather was Obama's primary male role model. Perhaps this helped inspire the future President's idolization of Grissom. • Dunham was living in Kansas when Obama's mother was born, and Grissom's Liberty Bell 7 is now kept in the Kansas Space Center museum. • Dunham is buried in the Punchbowl Cemetery in Hawaii, an ancient site of human sacrifice which now features a shrine to the goddess Columbia. • Another martyred astronaut is buried in Punchbowl- Ellison Onizuka, the first Hawaiian astronaut, who died in the 1986 Challenger (STS-51L) disaster. Onizuka was also an Eagle Scout and a member of the Triangle Fraternity. • Onizuka's birthday was the Feast of St. John the Baptist (in the epochal year of 1946), the same day that various Masonic orders like the Grand Lodge of England in 1717 and the OSTS began, which counted Grace Kelly as an initiate. • Onizuka gave his name to one of the shuttles on the NCC-1701D. 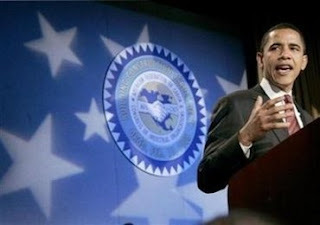 Finally, we've looked at the symbolism of the Obama campaign logo, as it relates to the Masonic icon of the Stairway to Sirius, and the point-in-circle symbol (which became a plot point in Red Planet). We've heard the stories of the design process and how and why this particular logo was chosen. Though not immediately obvious, I'd suggest that there may be another as-yet-unexamined influence on this particular logo, at least as it pertains to the symbolism. 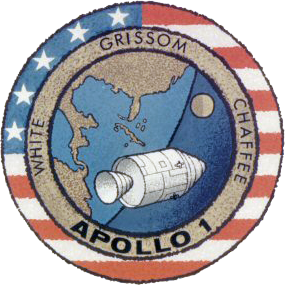 And that's the Apollo 1 mission patch, which also incorporates the Masonic point-in-circle (separated by the gold ring) and the American flag . There are 13 stripes in this case and 5 in Obama's logo, but there are 5 stars in the Apollo patch. Seeing the Moon rise on the Earth's horizon gives me to wonder if in fact that's the Moon in the Obama logo, not the Sun. Given Obama's encounter with the Apollo astronauts in Hawaii and his strange coincidental connections to Grissom, it's a possibility that should certainly be taken into account. Finally, there were two ill-fated starships by the name of "USS Grissom" in different Star Trek series. This ties into the uncanny Trek connections to Obama, which in turn reminds us of the future prophesied in the Star Trek universe, and how different that is from the world we know today. It's a future not many of us are well-prepared for. Militarism and mysticism- certainly the legacy of the Freemasons and their predecessors, the Knights Templar and the Mithraic cults. It's interesting to note that Harvard University- Barack Obama's alma mater- has seen an almost 800% increase in Masonic enrollment over the past ten years. If indeed we do see a large-scale Masonic revival (which would certainly be hastened by an economic slowdown), what does this mean for the rest of us? Given the lineage we've seen going back to Heliopolis and the concept of the Zep Tepi, as well as the unprecedented amount of strange traffic above our heads, could a Masonic revival be a portent of that long-awaited return? We'll be looking at the origin of the Masonic concept in the future, and how that may well tie into the Zep Tepi mythos. Freemasonry has always attracted engineers, functionaries, civil servants and professionals- left-brain types, middle-class by definition. I've no doubt there are several steps in the pyramid above them. UPDATE III: Grissom-less CSI scores 17.5 m viewers, down 11 percent. † Although the two men couldn't be more different in many ways, I can't help but think of Jack Parsons when looking into the life and legacy of Gus Grissom. *Again, it is my strong suspicion that Obama himself is an initiate of one of the countless Masonic orders out there, if not actually a Freemason (meaning an initiate of one of the recognized "Free and Accepted" orders).